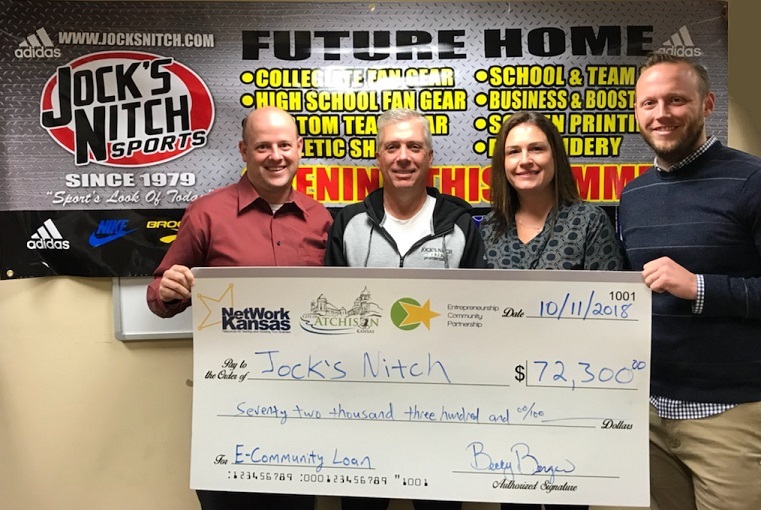 The City of Atchison’s E-Community Program is thrilled to announce a new deal with regional sporting goods retailer Jock’s Nitch. The new Jock’s Nitch store will be located at 729 Commercial Street in downtown Atchison and will feature athletic apparel from national brands such as Nike and Adidas, sports equipment (balls, shin guards, mouth guards, etc..), and licensed sportswear from local and regional schools and teams. The $72,300 in loan proceeds will help finance the acquisition and remodeling of the property at 729 Commercial Street. Jock’s Nitch, Inc. is owned and operated by Phil Minton of Pittsburg, Kansas. Additional financing for the project was provided by Bank of Atchison. Jock’s Nitch expects to have their new store open in the Spring/Summer of 2019. Since January of 2017, the Atchison E-Community Program has been offering loans for small business startups, expansions, and acquisitions. Everyday businesses like coffee shops, retail stores, doctor’s offices, art galleries, etc… can use this locally controlled, revolving loan fund as gap financing to make their small business dreams come true. The funding for the E-Community Program is created through the sale of entrepreneurship tax credits, which are allocated to NetWork Kansas by the Kansas State Legislature. To learn more about the E-Community Program, contact Justin Pregont with the City of Atchison at justinp@cityofatchison.com or 913-367-5506. Photo: From left to right, Brad Campbell (Bank of Atchison), Phil Minton (Jock’s Nitch), Casey Quinn (United Country Gateway Realty), and Justin Pregont (City of Atchison).